I had heard a lot about this graphic novel. Almost every book haul had it; almost everyone was talking about it online and offline (to some extent). I knew I had to pick this one up and I did and let me tell you that this one just did not disappoint at all. I had read, “American Born Chinese” as well, so I sort of knew what I was expecting from this one. 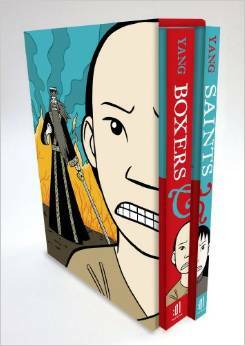 “Boxers & Saints” are two individual graphic novels, but can only be read as one, for them to make sense to the reader. The book is set in the late 1800s and at the beginning of 1900. The year is 1898. The place: China. The foreign missionaries are here to stay and not only that; they are going from village to village and town to town, converting the Chinese to Catholics. They mock their Gods and do not let them follow their faith. Amidst this, stands up Little Bao, wanting to fight the foreigners. He has learned to harness the power of the ancient Chinese Gods and begins to recruit an army of Boxers – common folks trained in Kung Fu, to fight the devils (the foreigners). Their power works and to a very large extent they are successful as well. Their trials and tribulations are recorded in Boxers. On the other hand, there is Saints, lending perspective to the Chinese that turned Catholics, through the eyes of one girl – an unwanted daughter known as Four-Girl. She has never been given a real name by her family. She has always tried to be loved, to be equal to her male cousins. But when she decides to convert, she gets a name, Vibiana and also an identity of sorts, a motive so to speak. Bao’s and Vibiana’s paths cross very briefly and that you can only know, once you read the novel. Gene Luen builds a powerful construct in the form of a graphic novel. He brings out the themes of religion, alienation, faith, and old versus the new brilliantly through this storytelling form. What is most interesting is that no one or rather very few people know of this time in Chinese history. Luen Yang brings that to fore, which is done subtly with Chinese Gods on one hand and Joan of Arc (yes you read that right) on the other, for inspiration and a struggle – both individually and for a nation. “Boxers & Saints” is a graphic novel well thought of – from every single perspective. If you want to read something unique and different, when it comes to the graphic novel, then this is the perfect read for you. Highly recommended! This entry was posted in Books, First Second, Graphic Novel, Review and tagged Boxers & Saints, chinese, Christians, First Second, Gene Luen Yang, Geography and Culture, graphic novel, historical fiction, Religious Fiction on July 7, 2014 by thehungryreader. There could not be a better time to read Graphic Novels than summer. Why do I feel that? Well, not really for any other reason, but somehow summers as a child and while growing up, always remind me of comics and graphic novels by that are an extension of comics. So there. “The Undertaking of Lily Chen” by Danica Novgorodoff is a heart-warming and at the same time, quite a ride of a graphic novel to read as the heat swelters away and there is only respite in more glasses of chilled water, with the air-conditioner braying along. “The Undertaking of Lily Chen” is about Deshi, a hapless and very lost young man, living in China who has constantly been in his brother’s shadow and now his life takes a tumultuous turn when his brother dies. According to ancient Chinese custom, there needs to be a corpse bride to accompany his brother into the afterlife. There is a dearth of corpse brides and Deshi has been given the task to find a bride for his brother. Then he meets Lily Chen and his life takes a complete spin. The illustrations are beyond gorgeous. The writing is funny, eccentric and empathetic. There is not so much drama, but at the same time the feelings and emotions are conveyed. I loved the book because of several reasons – one of course the illustrations, second because of the originality of the story, and third because it moved me. That I think are reasons enough and more to love a book. 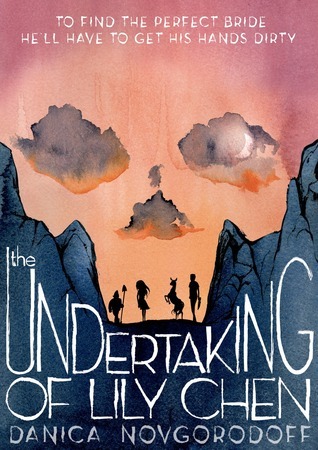 “The Undertaking of Lily Chen” is a beautifully thought of and executed book. It breathes life and hope into the reader on so many levels. An absolute must read for all the graphic novel fans out there. This entry was posted in Books, First Second, Graphic Novel, Review and tagged chinese, Customs and Traditions, Graphic Novels, The Undertaking of Lily Chen on June 16, 2014 by thehungryreader. I have always been a fan of Graphic novels. From the time I started figuring them out or rather discovering them. It was with Sandman I think and what a place to begin. At that time, I used to think that graphic novels only felt good when narrating a fictitious tale. I was so wrong and so mistaken. Over the last couple of years, I have read some brilliant non-fiction graphic novels – from Joe Sacco’s Palestine to Burma Chronicles by Guy Delisle, these guys know how to wrench your heart through the form of drawings and words in blurbs. This is what intrigued me about the first book in the “A Year of Reading the World” challenge which I have undertaken (inspired from the blog of the same name, started by Ann Morgan) – and the country to start with was Afghanistan. I did not want to start with the usual Khaled Hosseini (I love the guy’s writing but I wanted to discover something new). I had already read, “The Patience Stone” by Atiq Rahimi and loved it and yet I wanted something new. 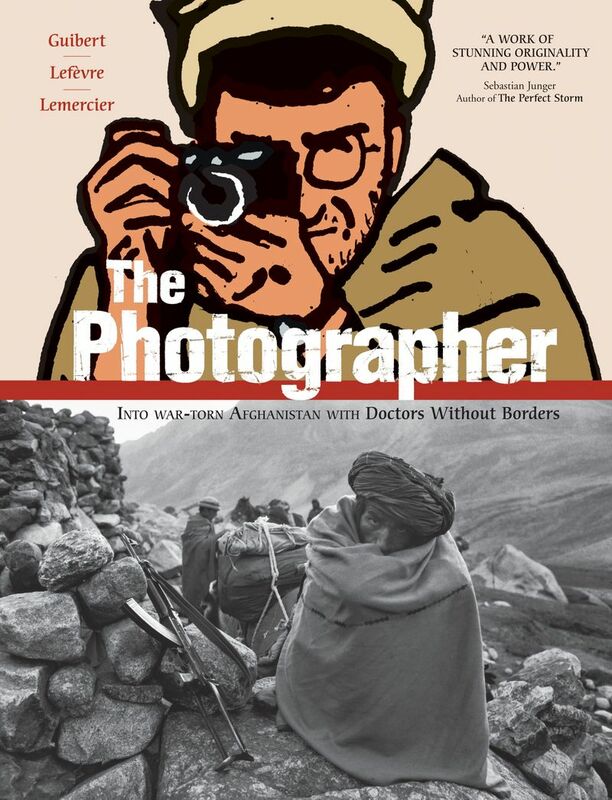 I then saw a title which intrigued me and that was “The Photographer” by Emmanuel Guibert. Now let me tell you something about the book. This is not your regular graphic novel. It is definitely more and in the way that a reader would love to explore more books of this nature (if they exist). The book is a graphic novel mixed with pictures as taken by the said photographer in the title – Didier Lefevre. Didier left Paris at the end of July 1986 to go to Afghanistan. It was his first project as a photojournalist, documenting the journey of Doctors without Borders into war-torn Afghanistan. That was the time; the Soviets were fighting the Afghan Mujahedeen. This was the time the US of A was supporting Afghanistan, unaware of how it would backfire years later. The book though is not about that. The book is about the war and help and moments of respite as seen through Lefevre’s lens. “The Photographer” is all about the perception and unbiased (mostly) perspective of a man with a camera and the need to capture it all. The book is created and compiled by Guibert along with Didier’s photographs. 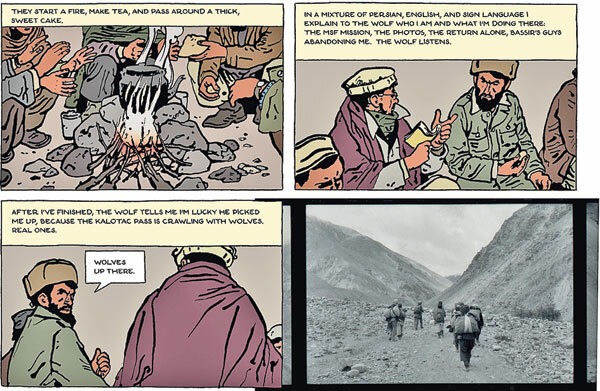 The war-torn Afghanistan as seen by Didier makes a perfect setting alongside its history. The people, the places, and their stories are beautifully captured and Guibert does justice to every single word and illustration – to go with the photograph. This book is a great beginning to how it all started – to how a country was ravaged, torn and how some selfless doctors also tried to save it. Most of all, it is about a photographer and how is life changed completely. 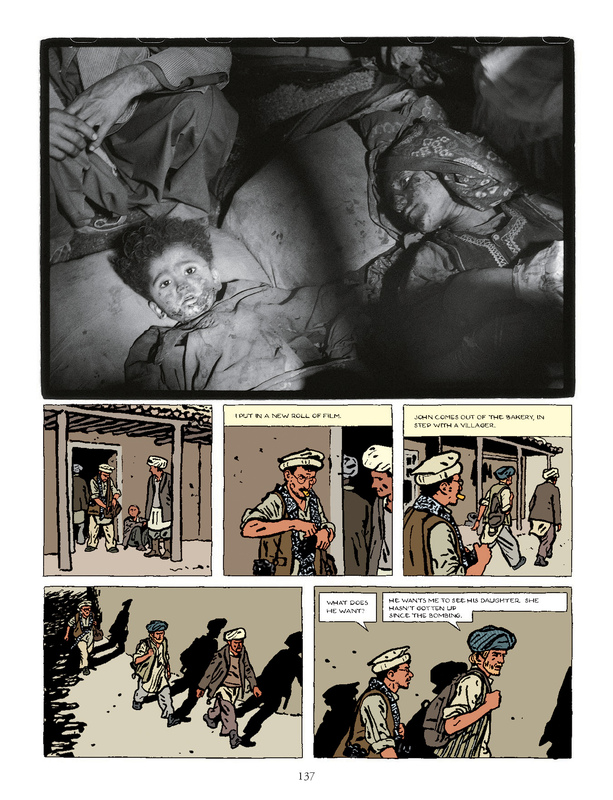 This entry was posted in Afghanistan, Books, First Second, Graphic Memoirs, Graphic Novel, Review and tagged 1987, Afghanistan, Emmanuel Guibert, First Second, graphic novel, Lefevre, Non-fiction, Russia, The Photographer, war on March 3, 2014 by thehungryreader. Anya’s Ghost is a great graphic novel for young teens – especially for young girls. The themes touched on this novel are universal – body image, being a part of a group or clique, the need to belong and the need to identify your roots and not let go of them, no matter what, and not to mention ghost busting as well. 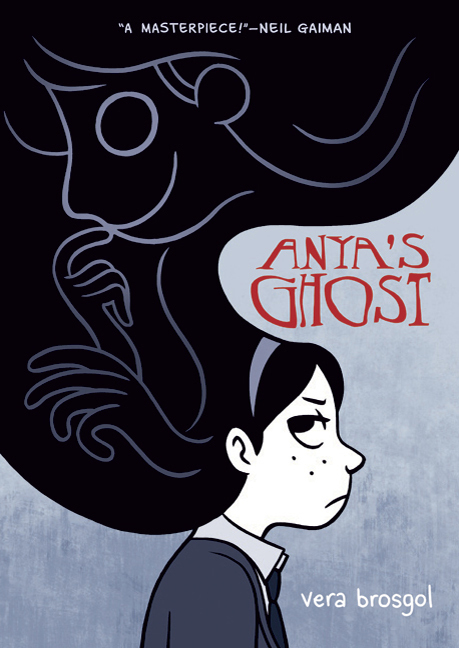 Anya’s Ghost is one of the few graphic novels I have read this year and I enjoyed it to the hilt. I always have felt that writing a graphic novel is far more difficult than writing a short story or a novel for that matter. It isn’t easy. It takes a lot to add words to images and vice-versa; however Vera Brosgol does an amazing job of it. Anya is a regular 9th or 10th grader at a lower-tier public school, who is embarrassed of her immigrant past. She has no friends at school, except for Siobhan. One afternoon, Anya has a fight with her and storms off into a nearby forest where she falls in an old well. There she makes an acquaintance of a ghost from 1918 named Emily. She has been hovering there next to her skeletal frame for years, mourning the death of her fiancé in WWII and herself at the hands of a murderer. One of Emily’s bones accidentally enters Anya’s bag and once she is out of the well, she realizes that Emily is here to stay. Before long, Emily and Anya become friends and Emily helps Anya overcome all her problems – with boys, fashion, school homework and friends. Anya’s world is idyllic till Anya realizes that all is not what it seems and what she has got herself into. Vera Brosgol has very intelligently through a ghost story merged the issue of identity and what it means to get over one’s foreign-ness in America. Brosgol seamlessly weaves through being funny, touching and thrilling. This is a book that can be enjoyed by all and for every graphic novel lover, I would recommend it so it can take the place on the shelf close to American Born Chinese and Blankets. This entry was posted in Books, First Second, Graphic Novel, Review and tagged Anya's Ghost, First Second, Ghosts, graphic novel, identity, macmillan, russian, Vera Brosgol on November 13, 2011 by thehungryreader. Any preconception that I had about graphic novels presenting simplistic or cartoonish stories was shattered by this book. Laika, is a complex story that focuses on the deep relationships that can be formed between humans and animals. The graphics and text work in concert to portray the action and emotion in this story, especially in the dream sequences where Laika imagines that she is flying. Readers who are familiar with graphic novels will appreciate the quality of the artwork and dialogue. Readers who are new to the genre will be easily caught up in the story that is being told. Laika is the story of the first dog to go up in space. It’s not a spoiler to tell you that she doesn’t come back. But Laika is really the story of the dog’s — and her people’s — life before she’s launched in Sputnik II’s tiny compartment. The Cold War, the space race, the USSR during that time, common human cruelty, loss, privation, powerlessness… all these provide a context and backdrop to Laika’s story, so the heavy feeling starts a few pages in and continues to the end of the story. There are compassionate and kind people throughout, of course, which only increases how sad you feel while reading it. Laika’s entire story, as conceived by Abadzis, is heartbreaking but there are certain moments towards the end that I found particularly easy to identify with. When Comrade Yelena visits Laika for one last time she can hear the dog saying her name with every bark, even when Yelena is too far away to hear them. She dreams that Laika is calling out to her for help. That she’s scared and uncomfortable and just wants to get out and play. Anyone who has ever owned a pet will be familiar with this feeling. When the pet is missing or in pain, it’s difficult to keep from emphasizing with it. How much worse then when the dog in question is imprisoned in a capsule and shot into the sky? Abadzis doesn’t just show Laika’s plight. He makes you feel it in the core of your being. The last page of this book contains a quote that offers a 1998 statement from Oleg Georgivitch Gazenko. In it, he laments the way that Laika was misused. “We did not learn enough from the mission to justify the death of the dog.” It’s a dead dog book. Anyone who knows the story of Laika will be aware of that. But above and beyond the obvious this is an ode to dogs themselves. To the animals that we befriend and love and, ultimately, destroy. It’s also about history, humanity, and the price of being extraordinary. No one can walk away from this book and not be touched. Consider Nick Abadzis a name to watch from here on in. 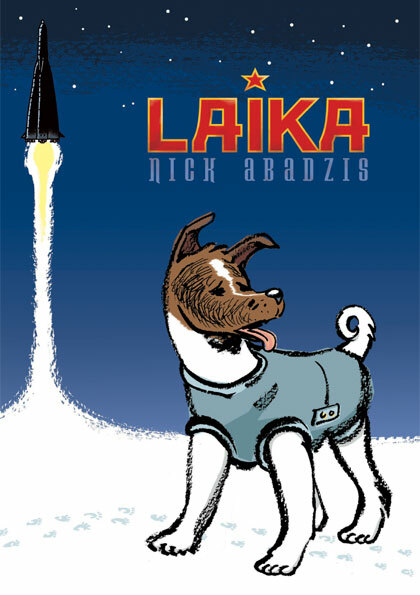 This entry was posted in Books, First Second, Graphic Novel, Review and tagged First Second Books, graphic novel, Laika, Nick Abadzis, Russia, space, young adult on May 22, 2011 by thehungryreader.